I’d had this and the next book in the series sitting around here for a long time. I had a vague feeling I’d read a review of it that wasn’t too positive, but I wasn’t sure and figured if I didn’t like it I could always stop and toss. However, though I had a few problems with it, I liked it pretty well. I especially liked the main character and the setting. The book has a lot of background and information about Mayan culture which I found interesting. The writing was good, the plot was fine. The rest of the cast were adequately three dimensional. Those problems: Lara McClintoch did some things that didn’t make sense; she put herself in jeopardy unnecessarily which I suspect was the author’s way to get past a kink in the storyline and move the story along. There were a couple of instances when she took pretty unreasonable risks. Well, she’s certainly not the first, nor will she be the last, to do that. The ending was a little abrupt, but I have no qualms and in fact enjoyed the book. It’s background and characters are good enough for me to recommend it to a reader who might like an archeological mystery. I went ahead and read the next two in the series, and enjoyed them too. Lyn Hamilton is a new writer for me, too. I like the exotic locale angle. 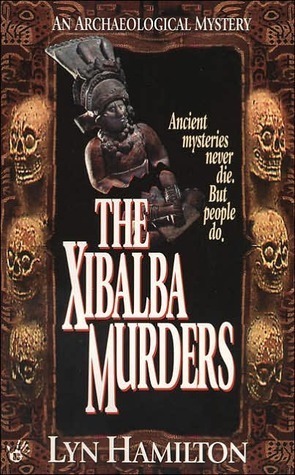 I haven’t seen this book–who could forget THE XIBALBA MURDERS? I believe Walter Albert was a fan of this series in DAPA-EM. I always meant to try one, but never did get the first book. I’ve moved on to other things, I guess, but I do like the idea of the series. I read this one back in DAPA days, maybe because of Walter’s review. She died at 65 of cancer, in 2009. I have this book but haven’t read it yet. Sounds worth finding it and reading it sometime soon.